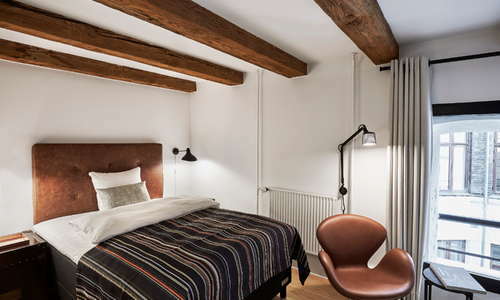 In this well-preserved former spice warehouse, the rooms are small but cozy and the welcome is genuine. 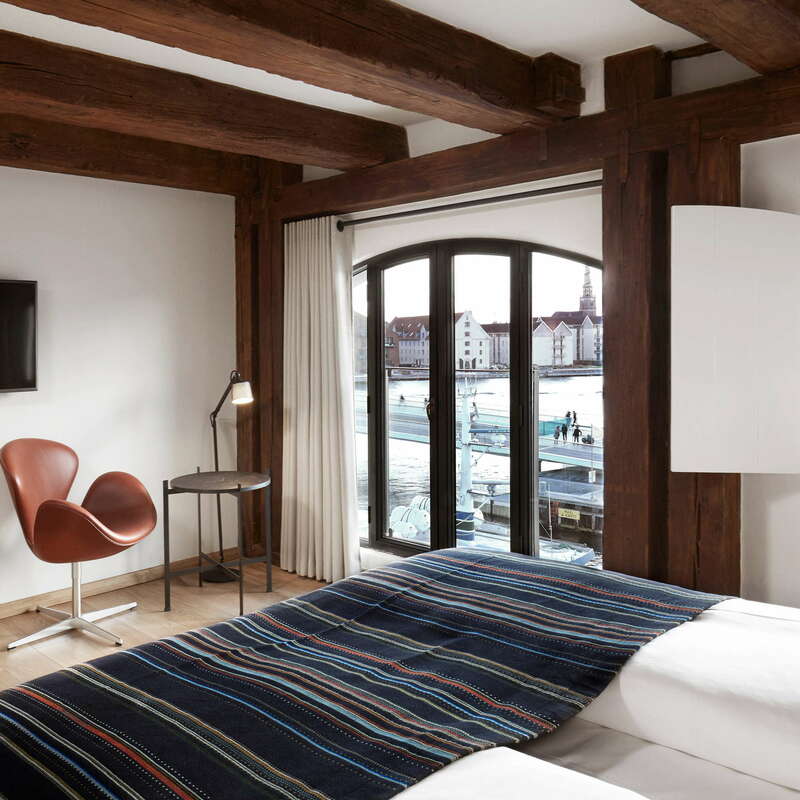 The hotel is in a great location overlooking the old ships of Nyhavn. 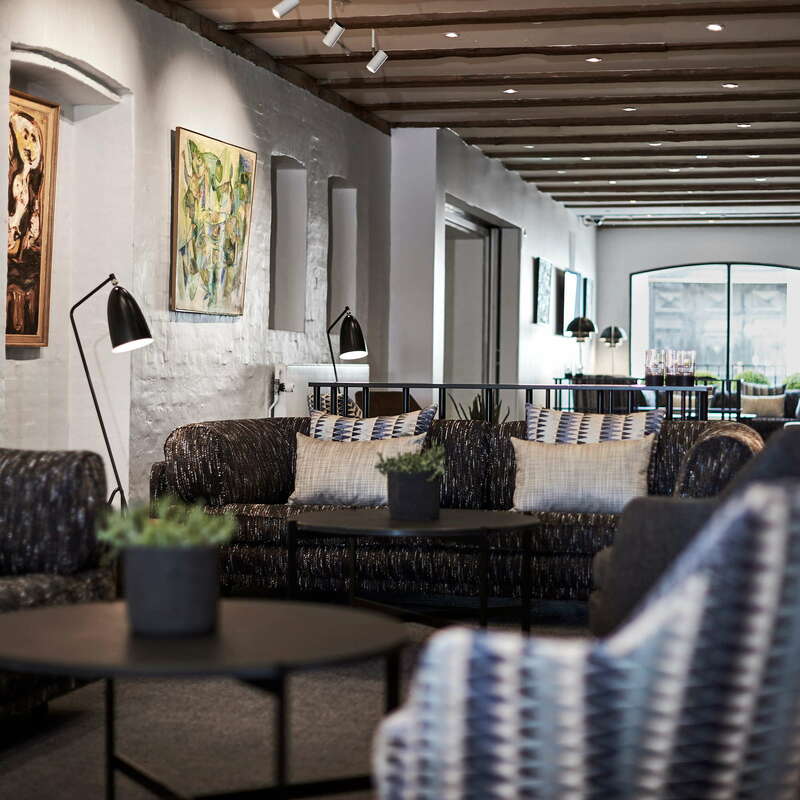 Inside, you'll find lots of exposed brick beams, and the thick plaster walls are adorned with paintings by prominent Danish painters, including Jens Jørgen Thorsen; Asger Jorn; and the hotel's own founder, Alf Arp-Hansen. Dogs are welcome. 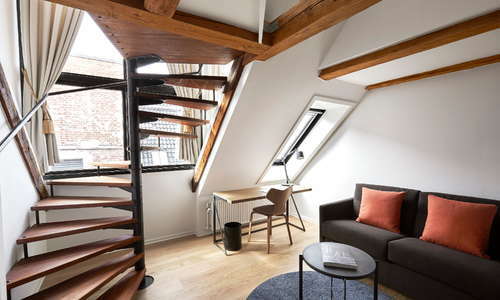 The hotel was once one building, but its original owners - two wealthy spice merchants in the 19th century - fell out and split it down the middle after flipping a coin. 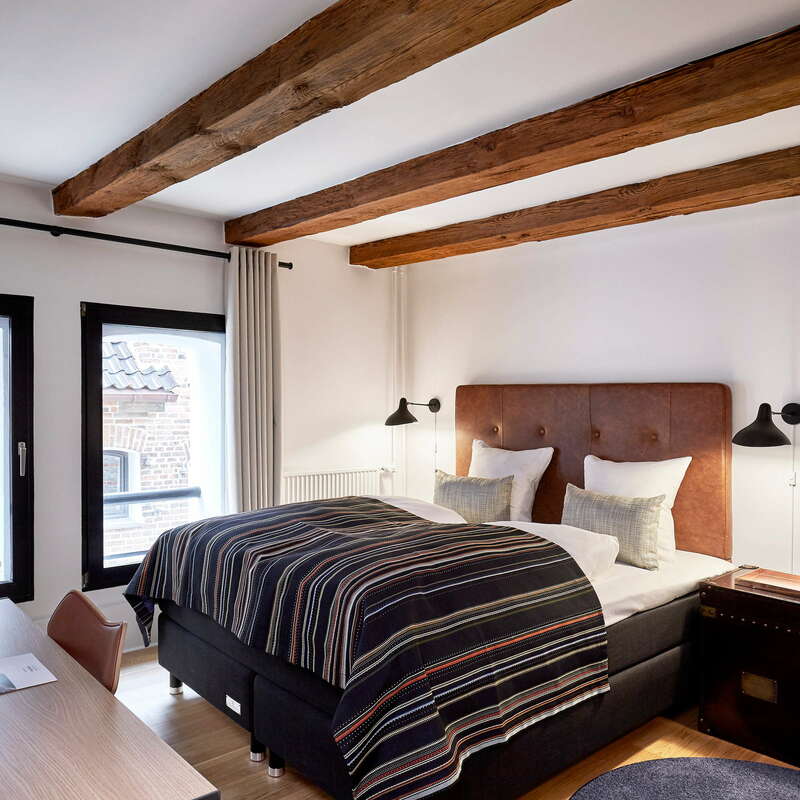 There are single rooms, double rooms and suites, all with warm woolen spreads, dark woods, soft leather furniture, and crisscrossing timber beams. Many have great views through curved windows with authentic-style shutters, and nice touches like coat hangers that look like antlers. Junior Suite 14 in the gables has a gorgeous outlook on the sea. 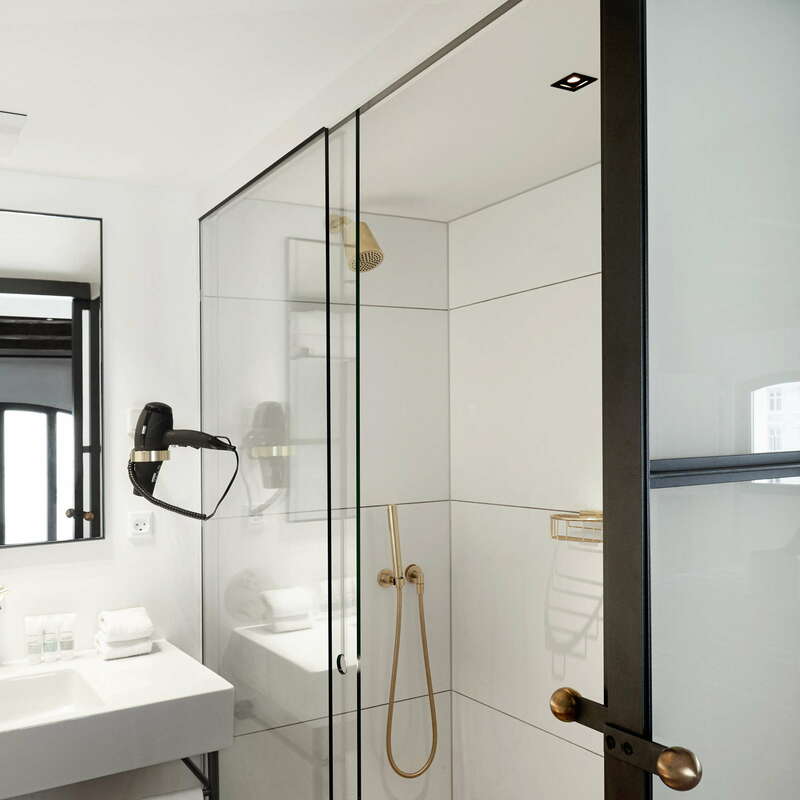 Bathrooms have clean, calm lines, with gold fittings and - unusually - more beams! 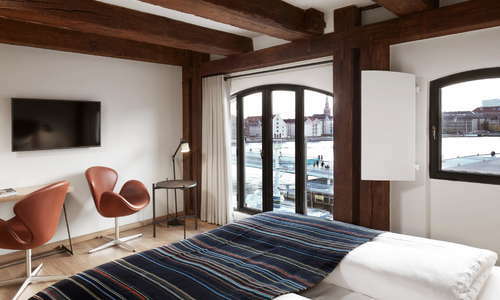 YOU SHOULD KNOW The hotel is made up of two linked warehouses called the red and yellow warehouse. 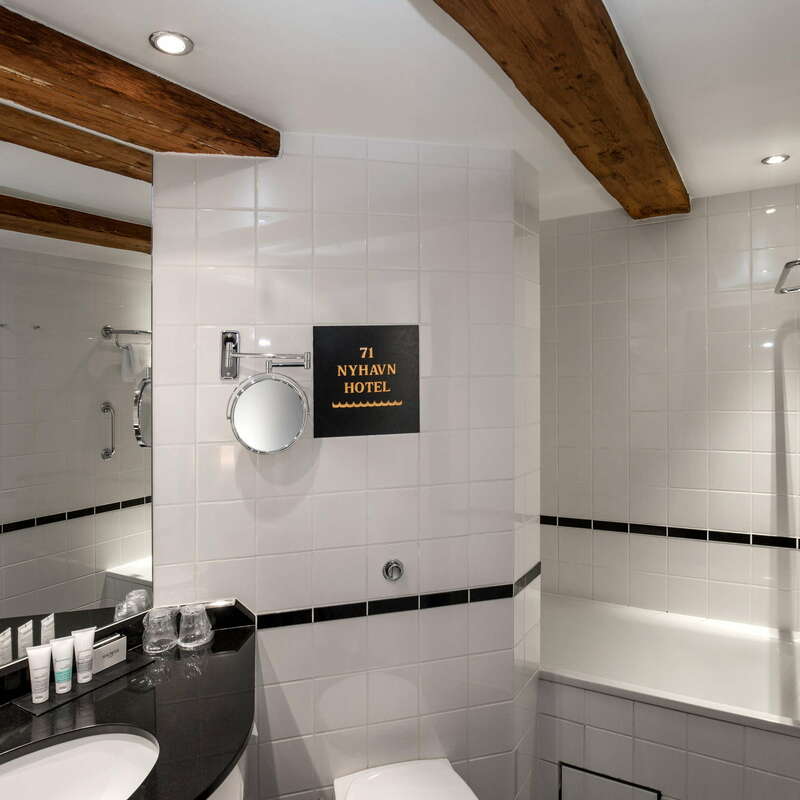 In the red warehouse, the bathrooms only have showers, so if you are on the hunt for a tub, speak to the staff about the rooms in the yellow. 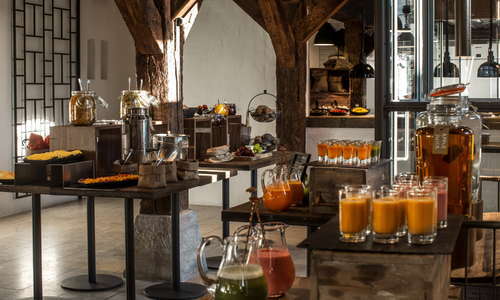 The small lobby is staffed by eager, knowledgeable recruits who are keen to help guests. 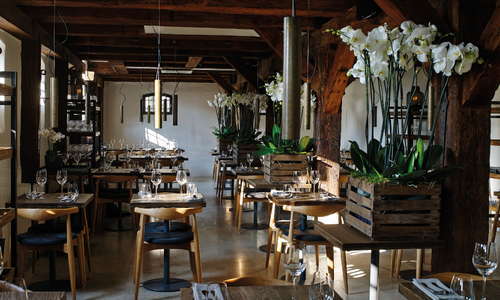 The hotel's Thai restaurant, SEA, is an outpost of Kiin Kiin, Denmark's first Michelin-starred Asian gourmet restaurant and the only Thai restaurant with a star outside Thailand. 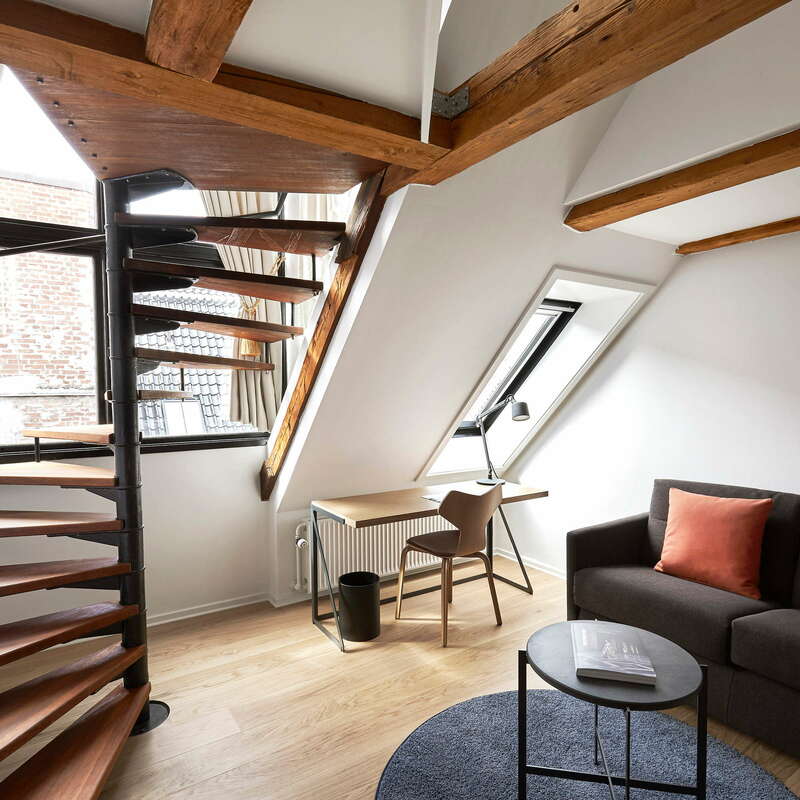 That is enticing enough in itself, but the hotel's airy, beam-led look continues in its dining area, and adds to the temptation. 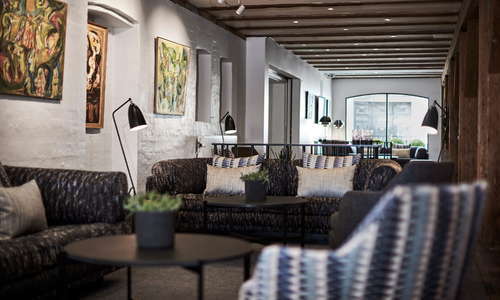 The attached bar is lovely: one of the most properly 'hygge'-style that we've seen in the hotels in Copenhagen, all beams and little lights in sea lanterns. Try the SEA mojito - the kaffir lime, lemongrass and ginger beer give it a tasty Asian kick. The hotel is right in the middle of the touristic hotspots of Copenhagen. 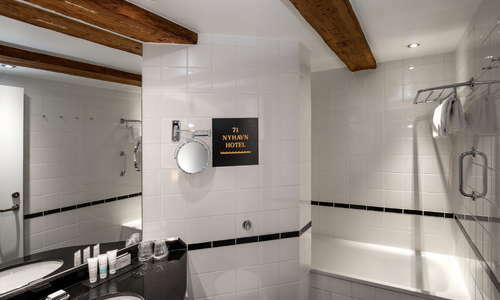 For trips further afield, as well as bike rental, the Kongens Nytorv metro stop is a short walk away (7-minute walk). 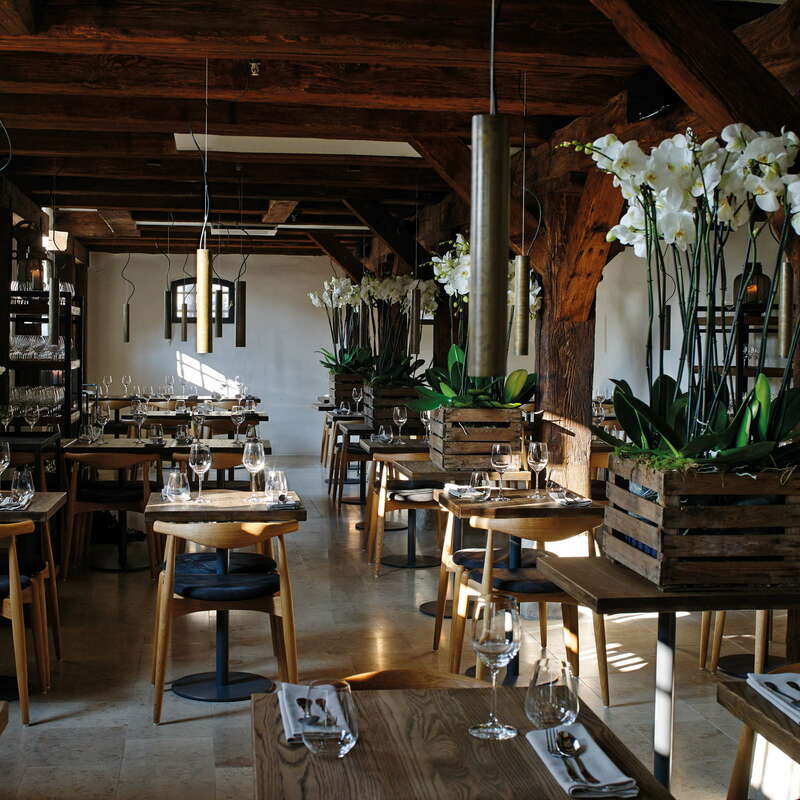 Restaurantionen (12-minute walk) offers an old-school Danish restaurant dining experience at its finest. 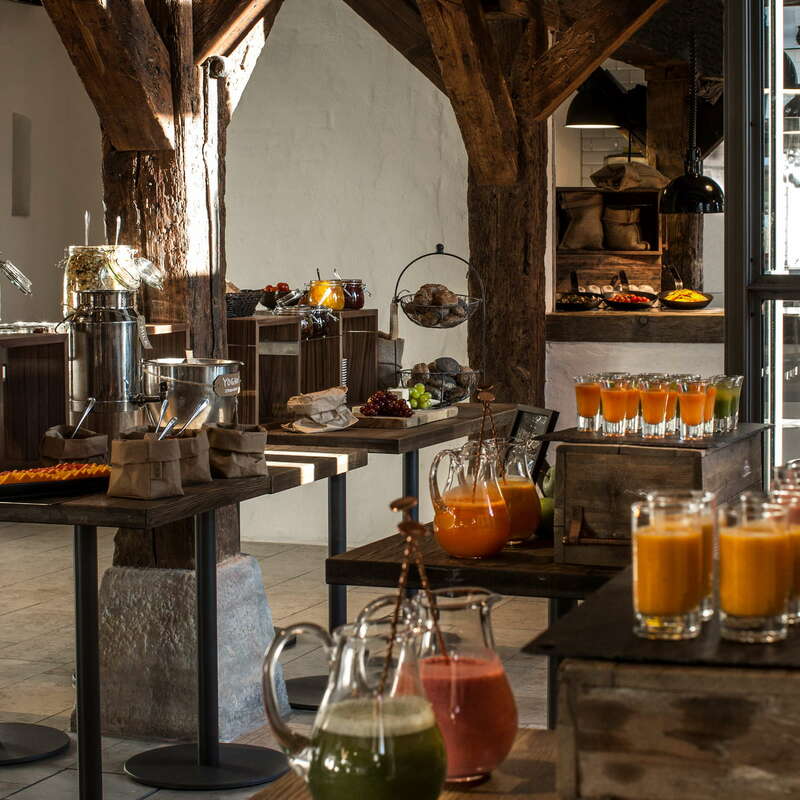 The food itself is modern, but the service is classic, including the cheese cart. 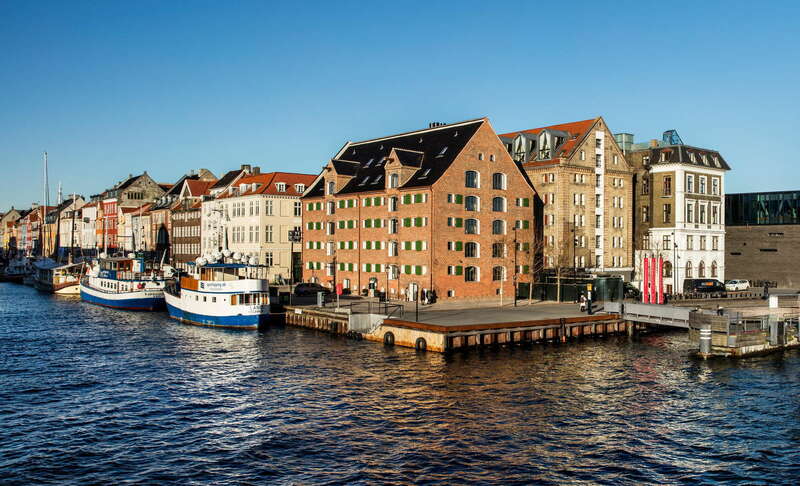 Or try one of Copenhagen's top restaurants, Amass (28-minute trip, inluding a ferry). 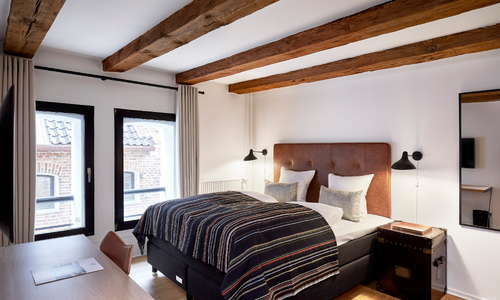 The staff at 71 Nyhavn will help you find the harbour bus, 10 minutes from the hotel, and then the last stop before the sea drops you a short walk from the restaurant's huge vegetable garden lit by bonfires. The cuisine, dished up by ex-Noma head chef Matt Orlando, keeps up the wow factor. Llama (10-minute walk) starts the evening serving fresh Latin and South American-style cuisine, and ends it with DJs and cocktails from the same part of the world. Worth a visit any time, we'd say. Chic wine bar Nebbiolo (6-minute walk) is particularly lovely as the sun sets in the summer season. 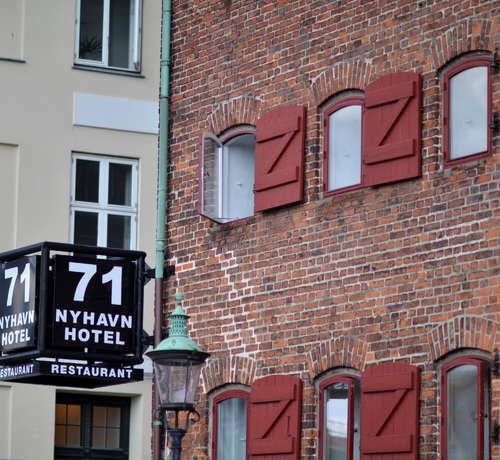 One of Copenhagen's greatest charms is its beautiful seafront location, and 71 Nyhavn capitalises on that. 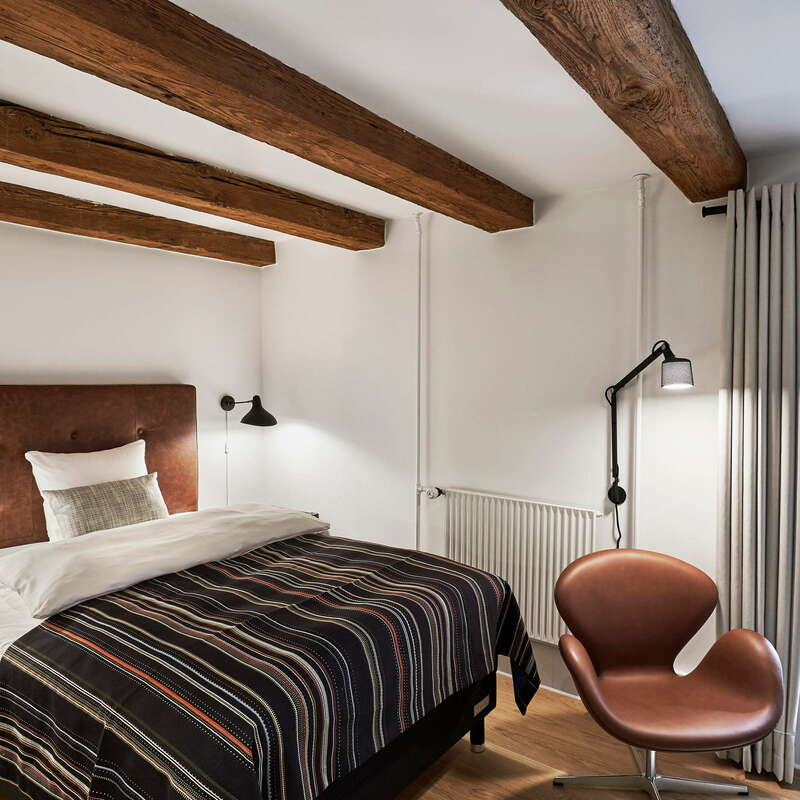 The historic building (did we mention the beams?) is picturesque, and staff go out of their way to help guests. Plus, the restaurant matches a lovely ambience with top-quality Thai cooking.